This is the second of two blog posts on the Tallan blog in my overview of the Microsoft Certified Solutions Associate (MCSA) certification for Office 365. I set up this two part posting as an overview of the certification, an outline to the different certification paths, and to also provide a summary overview of some of the changes to the 70-347 exam, which recently went effective at the end of June (2016). 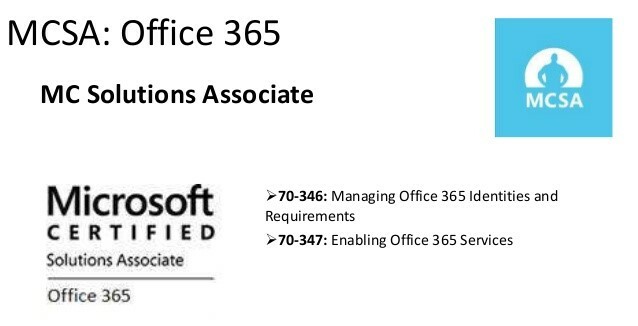 There are two exams, in total, for the certification – the first part is the Managing Office 365 Identities and Requirements (Exam 70-346), which I covered in my last post and the second part, covered in this post, is Enabling Office 365 Services (Exam 70-347). I recently completed these two exams over a couple of months of study as I outlined in my prior post. I don’t want to get into the full details over a second post, but I would encourage you to review the summary there regarding the Microsoft Certified Solutions Associate (MCSA) certification and the difference between it and the Microsoft Certified Solutions Expert (MCSE) certification which generally (but not always) requires recertification over a three year period. With respect to the 70-347 exam, some of the study topics have now been changed from their original “skills measured” outline, as originally listed on the Managing Office 365 Identities and Requirements webpage. The following is the list of changes to Exam 70-347, which have been made to reflect the latest updates and features to Office 365. These exam changes are effective as of June 30, 2016. I have highlighted in bold red some of the changes, (as provided from Microsoft Learning). There has been some text removed and where and when it seemed applicable, I marked it up as bold, red strikethrough text. That’s a wrap for this write up – please keep your eye here on the Tallan blog for my future technology posts.